PRESS RELEASE: James Bond Producers, Michael G. Wilson and Barbara Broccoli today released the title of the 24th James Bond adventure, SPECTRE. The film, from Albert R. Broccoli's EON Productions, Metro-Goldwyn-Mayer Studios, and Sony Pictures Entertainment, is directed by Sam Mendes and stars Daniel Craig, who returns for his fourth film as Ian Fleming's James Bond 007. 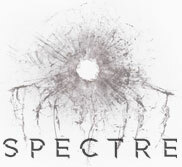 SPECTRE begins principal photography on Monday, December 8, and is set for global release on November 6, 2015. Commenting on the announcement, Wilson and Broccoli said, "We're excited to announce Daniel's fourth installment in the series and thrilled that Sam has taken on the challenge of following on the success of SKYFALL with SPECTRE. ".